With decades of musical & spiritual dedication, SRI Kirtan comes as, a duo of refreshing fun and spiritual devotion in the expanding kirtan/chant scene. 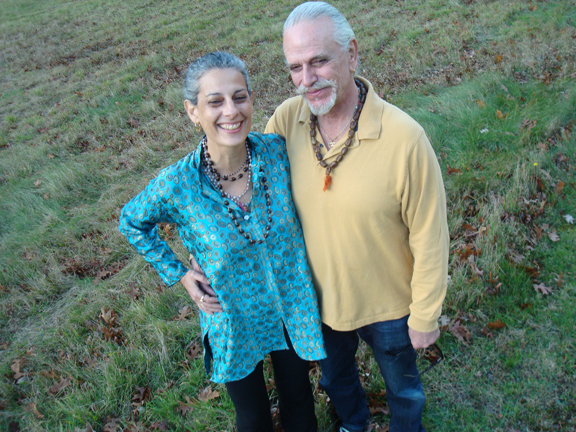 Exploding out of Woodstock in 2004, Sruti Ram and Ishwari, now known as SRI Kirtan have been a staple of many of the most prestigious kirtan events including the Omega Ecstatic Chant, Bhakti Fest as well as regular appearances at Kripalu and Jivamukti Yoga NYC. “I had traveled through the musical world, from folk to punk then opera to electronica and finally here to world spiritual music,” says Ishwari. “It’s a dream to join forces with Sruti Ram who comes with 40 years of kirtan leading experience aside from his background in Gregorian chant, opera and doo-wop.” This unbelievable duo create an explosive fusion of ancient chants mixed with folk/gospel/hip hop creating some of the catchiest tunes ever heard in the kirtan/chant scene. Proof of this is heard in Live Your Love (Mantralogy/Ishwari Music 2010). Joining forces with producer Julie Last (Joni Mitchell, Ricki Lee Jones), SRI Kirtan undertook the ambitious job of topping the energy and joyfulness heard on their first album. Calling in all the troops, Live Your Love is a true gathering of the kirtan community and a testament to how caring and conscious this music scene is. As Sruti Ram exclaimed, “It was unbelievable. One day Steve Gorn (one of the most famous bansuri flute players in the western world), is in the studio, next Visvambhar from The Mayapuris is laying down blistering drum beats!” Adding to the fun, SriKala, a young yet highly successful underground Brooklyn rapper lays down heart felt lyrics and devotion on several tracks including the title track ‘Live Your Love’. Other guest artists include Charlie “Govind” Burnham on violin, Noah Hoffeld on cello, Kyle Esposito on bass & electiric guitar and Curtis Bahn on dilruba & sitar. “We are excited to get out and sing these songs with crowds around the world!” Ishwari exclaims. “As Sruti Ram said, it’s all about chanting together. We had the live kirtan experience in mind during the entire song writing/recording process.” SRI Kirtan will be stopping at the major kirtan/chant festivals such as Omega Ecstatic Chant, The Bhakti Fest as well as East Coast and West Coast tours including Hawaii in promotion of Live Your Love. If you haven’t experienced SRI Kirtan before, you will most definitely want to. If you have already, you know you will be back for more. pl. send me bhajans on my E mail Id , devotational music ,bhajans of pt.jasraj,pt.bhimsen joshi ,A.jalota. thanks for above favour.